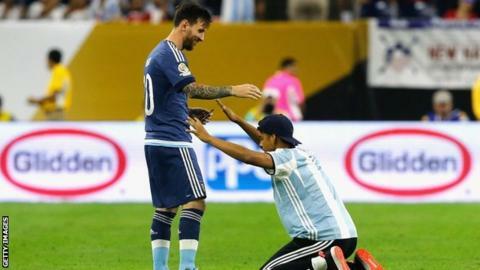 Lionel Messi became Argentina's leading scorer with a superb free-kick as they beat hosts the USA 4-0 to reach Sunday's Copa America final. The Barcelona forward, 28, passed Gabriel Batistuta's 54-goal tally with a 25-yard strike. Messi provided the assist for Ezequiel Lavezzi's opener, then scored his stunner before Napoli's Gonzalo Higuain fired in to make it 3-0. Higuain scored with a tap-in in the 85th minute to complete the rout. "I am happy to have surpassed Batistuta's record and I want to thank my team-mates, it's theirs as well," said Messi, who turns 29 on Friday. Hebei China Fortune winger Lavezzi will miss Sunday's final, against Colombia or reigning champions Chile, because he fractured his left elbow after tumbling over the advertising boards. The incident happened in the second half when the former Paris St-Germain player fell over backwards, trying to control a pass with his chest.